It started with the good. We took our flight to Singapore from Bali to connect and go on to Bangkok. In Singapore we were lucky to enjoy the Cathay Pacific Sky View lounge where we caught up on the lack of food from the last 24 hours and enjoyed the coffee and other beverages. We left stuffed and happy and ready to take on the next 24 hours of trains. The Bangkok city trains were easy, about 75 baht and only an hour later we were at the Hua Lamphong train station in line to book our trip. Then came the not so good. I had heard the overnight trains book up early, but optimistic Caroline insisted we would be fine. Once at the airport the guy that worked there checked the schedule and informed us that the sleeper cars were sold out (I am still questioning his honesty on this information) but there were train seats available and the train didnt leave until 10 pm. Luckily there was an overnight bus that left in 2 hours and if we were going to be sitting what did it matter whether it was on a train or bus? 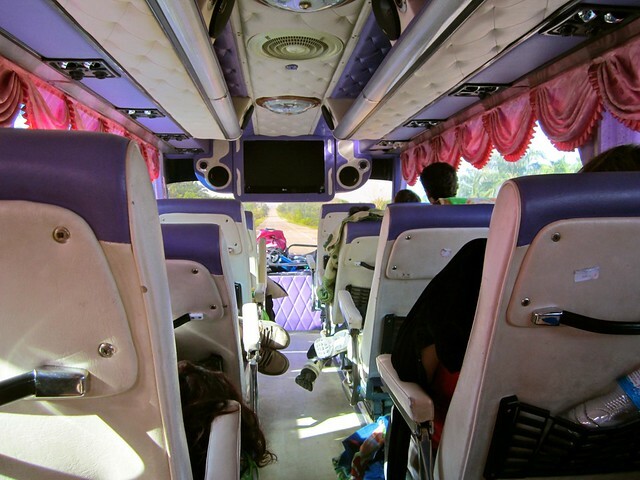 The bus also took us directly to Krabi where we wanted to go instead of the train where we would still have to take a three hour bus from Surat Thani to Krabi that next morning. 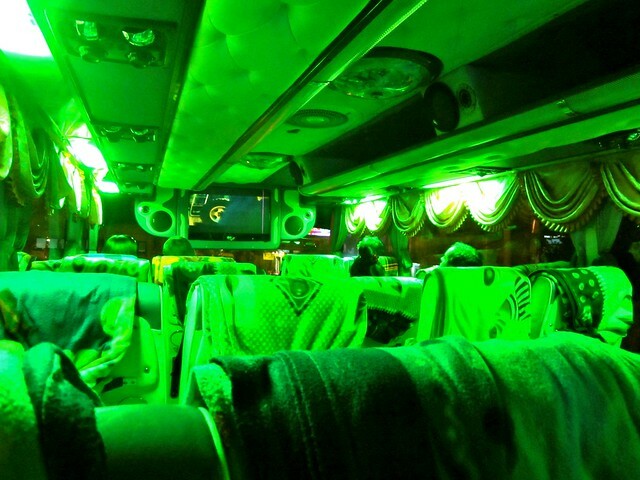 The bad came when we arrived on the bus. Not at first, but 2 – 3 hours in we both started to realize it was going to be a long 24 hours. 3 hours in we stopped on the side of the road for almost two hours and picked up an additional 10 -12 people off a second bus where the air conditioning had broken down. The more people added extra heat and filled up the once empty seats. The seats “reclined” but the comfort wasn’t helped at all by the small degree of lean. Our bus stopped every 3 hours to drop people off or take a break. You’d think a break would be nice but in reality the lights are thrown on, the driver literally screams the name of the stop we are at (and while loud, still sounds like gibberish) and it takes about 30 minutes until we start moving again. This made it impossible to sleep. The smelly came a few hours in. I can’t tell you who or what did it but I can tell you it was coming from directly below us and once in awhile (every hour) the bathroom door would swing open and everyone on the upper level would come close to losing their Thai food dinner. I am not sure if anyone has written unspoken overnight bus bathroom rules, you might see that post pop up here later. If you have serious business to do I suggest you try your darndest to get it done prior to boarding the bus. I understand when you gotta go, you gotta go, but it makes it awfully smelly for the rest of the 20+ hours the rest of us are trying to sleep. Will I take an overnight bus again? Yes, despite the lack of sleep, bumpy roads, smelly bathroom and numb booty, when the ride was over we were at our destination. Mission accomplished. I like the idea that I saved a day of travel and got it over with at night, a quick nap and we were on our way exploring and enjoying the sunshine. What’s your worst overnight bus/train experience? I prefer the train. A smooth ride, usually a dining car and you can walk around if you need to. My best experience was in Japan on the Shinkansen. My coworker and I arrived at the platform 20 min before our train was supposed to leave, put our bags and coats on the train then hopped out to buy some food at a kiosk that was just outside the door. After a few minutes the doors of the train closed and it took off with our gear. A few minutes later, OUR train arrived only 10 minutes before it was to leave. Trains in Japan are TOO efficient. After a few hours of trying to explain what happened and taking a train that followed the one with our bags, we retrieved our bags and coats with all electronics from the lost and found at the Nagoya Train Station. Only in Japan could you leave your gear on a train and retrieve all of it, intact. I never knew about that. Asia seems to be pretty safe in general in regards to theft. We haven’t had any issues so far. That sounds like a pretty miserable ride. When I was studying abroad in Madrid in 2009 my friends and I decided to take the go down to Cadiz to celebrate Carnival, but with all the cheap places to stay book up already we decided we’d take the night bus down, tour the city all day, go out at night and then take the morning/afternoon bus back. We way overestimated our energy levels. After a miserable first night bus down we barely had the energy to get through the day and decided to just skip going out at night and take the night bus back. Thankfully we had a fluent Spanish speaker with us who was able to negotiate the last vacant seats on the bus for us. The people already on the bus refused to move over to allow us to sit together so we were all scattered around in the back of the bus, sitting next to less than appropriate looking characters. Mid way into the bus ride one of the crazy looking men decided to lay down in the aisle with his pants unzipped and his hand down them. Meanwhile another man continued to viciously throw up for what seemed like hours. It didn’t help that the back of the bus wasn’t getting any A/C or ventilation. All in all a terrible journey back to Madrid! Ha, I am sure you will run into some more miserable bus rides on your travels! We never know what to expect when we show up for the bus. We extended our layover to a week in Madrid, send me suggestions on what to do in Madrid! +34 915 32 00 72 ‎ — when I was there in 2009 you just buy a drink and they give you a plate of free tapas with it so it was a great deal for a tight budget. The place is always super packed – we were never able to get a seat but it was fun to be in the bustling atmosphere and a great way to have a cheap meal with drinks. I think the place has recently started to get bad reviews so I’m not sure how good it will be but back in 2009 it was a great deal and the food was pretty good. +34 915 21 07 08 ‎ — this is another good tapas bar/cafe – lots of different options, interior is interesting, servers were always nice and prices are reasonable. Oh dear! I’ve taken a lot of overnight buses in Latin America and have had really great experiences on the whole. I was hoping Thailand would be similar. I guess you’re never going to have the best night’s sleep on a night bus, so I’ll give it a go. Worst case scenario, I fall asleep on the nearest beach as soon as I arrive!